Germans from Russia - Kase Knepfla (CheeseButtons) - The BSB SportzMan - A Forum for OutdoorzMen! 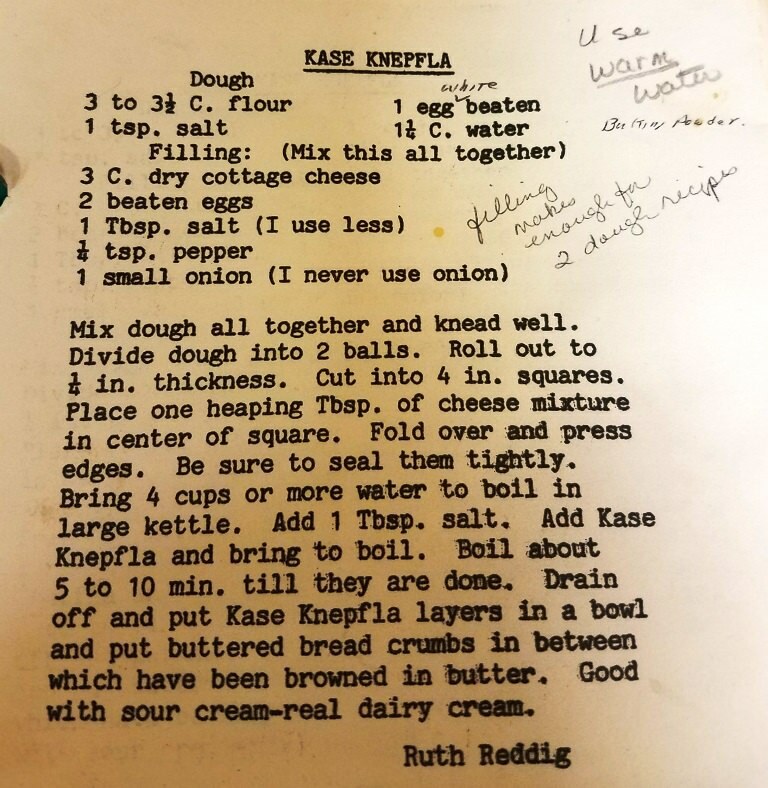 My father's sister married a man with a very similar German-from-Russia background, and this is his mother's recipe for Kase Knoephla (also spelled Knepfla, among many other variations); these are also known among Germans-from-Russia descendants as "Cheese Buttons." My cousin, Penny, recently sent this recipe to me, and I will be giving it a go, after Lent; however, I did want to share it with you all in the event that anyone might want to give it a try. *Asterisk denotes slight modifications or notes made by the family over the years. Mix dough all together and knead well. 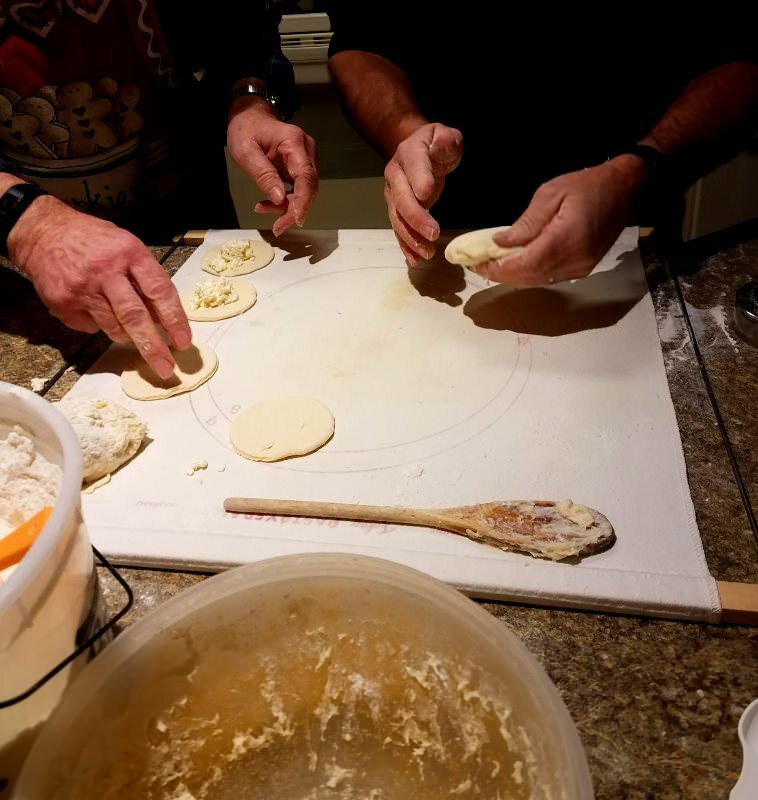 Divide dough into 2 balls. Roll out to 1/4-inch thickness. Cut into 4-inch squares. Place 1 heaping tablespoon of cheese mixture in center of square. Fold over and press edges. Be sure to seal them tightly. Bring 4 cups or more water to boil in large kettle. Add 1 tablespoon salt. Add Kase Knepfla and bring to boil. Boil about 5 to 10 minutes until they are done. Drain off and put Kase Knepfla layers in a bowl and put buttered bread crumbs in between which have been browned in butter. Good with sour cream - real dairy cream. Here is our knoephla (cheese buttons) recipe. This was a Seibold/Reddig tradition...mostly Seibold, which are German-Russian, but Dad said it's an all-German thing. However, Ron [Penny’s Husband]'s mom came from Germany and never heard of them. We do have a friend out east however who is German ancestry and she has had them. 1 fillings recipe is enough for 2 dough recipes. We didn't put in baking powder, sometimes they do but I don't know how much...not a lot. We don't cut into 4-inch squares. Mom and Dad use a round cutter...3 to 4 inches, again I'm guessing, and then they used a melon baller/scoop for the insides...and cover with another circle. Use warm water to meld them together. I should add...we don't use the bread crumbs, just use melted butter on top. [In the picture,] Ron [Penny’s Husband] rolled them so they were a little less than 1/4" thick. You'll know if you are too thin or too thick. We always have sausage with them too, and some people...NOT me...have sauerkraut. As mentioned above, I’ll be trying them, and soon; my “must-try” recipe list is starting to get pretty long, but due to the family connection, these will be tried as soon as possible. I am hoping to learn a bit more about the "dry" cottage cheese. I have absolutely no experience with it, but I have seen it in one grocery store in Lewistown, Montana, so I know it exists. I am going to try and get my hands on some when I try this; if I am unable to get some, I’ll look at possible substitutions. If anyone wants to try this, I'd be really interested in how it goes!